The history of St. Stephen&apos;s is most unusual. In early March 1979, Bishop Stephen Leven, third Bishop of San Sangelo, asked Rev. James Bridges to develop and new parish in Midland. The first organizational meeting was held at St. Ann&apos;s cafeteria. Before a permanent church was built, Masses were celebrated at Trinity School. The last Mass was celebrated on Pentecost Sunday in 1979 when the papal nuncio in Washington asked that everything be put on hold as Bishop Leven had resigned for health reasons. In August 1982, the Most Rev. Joseph A. Fiorenza, D.D., fourth Bishop of San Angelo, appointed REv. Robert M. Kelly to go forward with the development of St. STephen&apos;s and appointed him pastor. 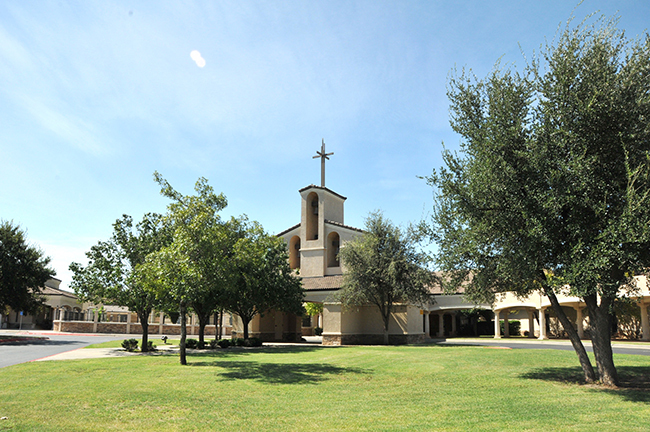 Sunday Masses were held at Alamo Junior High, and weekday Masses at St. Nicholas Episcopal Church. St. Stephen&apos;s first bulletin was printed for the week of September 5, 1982. The first Mass on site was Holy Saturday, April 21, 1984. Msgr. James Bridges had the distinction of being the first priest ordained in the Diocese of San Angelo and was called uppon to be pastor of St. Stephen&apos;s on July 1, 1996. He assumed the shepherd&apos;s role of leading the flock of St. Stephen&apos;s, and in a few short years the parish was free of debt. Plans were then made to build a new sanctuary. On June 30, 2002 the Church community, along with then Mayor Mike Canon, gathered for the ground breaking of the new sanctuary. Dedication of the new building was September 3, 2003. Within one year parishioners had paid off the debt. There are some unique features in the sanctuary. The stone used for the columns, the altar and the baptismal font were hewn out of limestone (called Hadrian) from the Garden City area. The elaborate tabernacle which now adorns the church was rescued from a church that was destroyed during World War II in Paris. The Corpus on the Crucifix behind the altar is from the 17th century and depicts the suffering of Christ. St. Stephen&apos;s has been blessed with many priests that have served the parish: Rev. Robert Kelly; Rev. John Waldron; Rev. Dan McCaffrey (interim); Rev. Lawrence D&apos;Mello (interim); Rev. Alvin Wilde; Rev. Art Pestin; Rev. Charles Vogel and Rev. James Bridges.